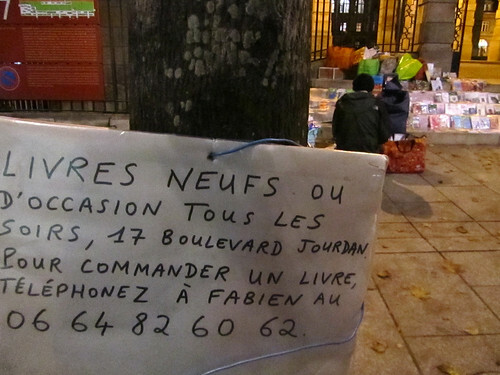 Since I moved here, I’ve seen this bookseller at the main gate of Cité U nearly daily in the evening, either setting up the “stall” by displaying the books on the staircase (there are numerous editions of Petit Prince and in different languages), or chatting with punters (serious or otherwise), or trying to sell packets of tissue paper (10 cents each). With his latest advertisement hung on the tree, I finally know name his name (Fabien). It has been a tad disconcerting walking past someone who regularly says hi to you but you haven’t a clue of who they are. I admire his tenacity, of staying outside and let fate chose the way things go. I also once saw him leaving in the evening – his bicycle was stacked with more books and he looked almost comical as he pedalled hard to go home for the night. yup, got to look for something to make things a lot less mundane. i did try to photograph him that time i saw him on the bike, but it was dark and the photo was blur. i was caught by surprise too, so it took time to fumble the camera out!